John Bundy was born in Guilford County, North Carolina and raised near Monrovia on a farm in Morgan County, Indiana. 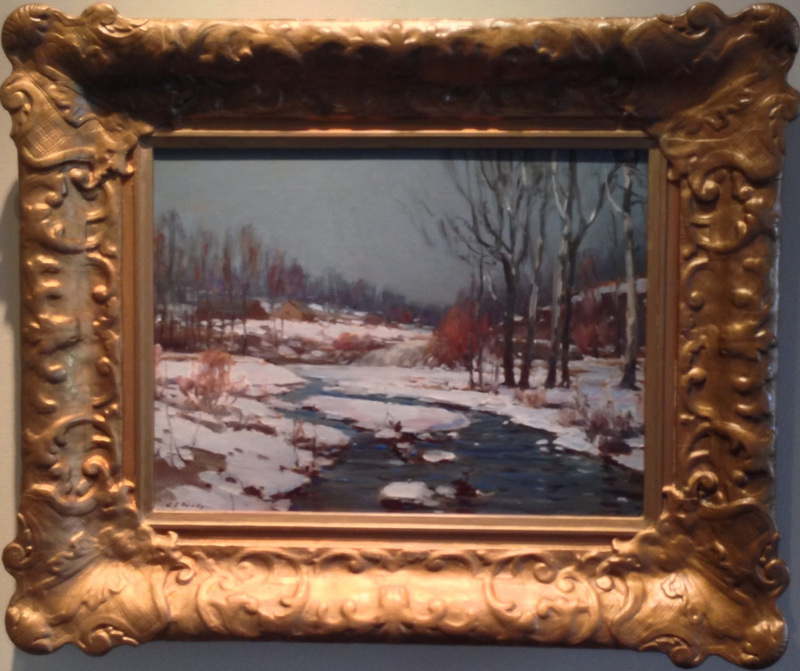 He was part of the Richmond School of Indiana painters and Richmond’s premier artist. Bundy attended Quaker schools and married Mary Marlatt in 1875. He spent nearly a decade in New York City as a portraitist and was also a photographer, but later decided to focus on landscape painting. He worked in both oil and watercolor, with much of his subject matter coming from Wayne County, Indiana, especially the Whitewater Valley. In 1888 he moved to Richmond and for eight years headed the Art Department at Earlham College, where he taught drawing and painting. During that time a book of his etchings, “Fond Recollections”, was published. This book reflected his love of the scenery around Earlham. After the death of his wife in 1906, John E. Bundy built a studio behind the family home in Monrovia and lived with his sister. From 1910 to 1911 he traveled in California and then spent several summers in Northern Michigan on Little Traverse Bay, where he painted primarily in watercolor. By the early 1920s he remarried to Elwood Morris, a Richmond painter. He exhibited widely across the United States, including the 1904 Louisiana Purchase Exposition, the Pennsylvania Academy in 1904, the National Academy of Design in 1911 and 1916, the Chicago Art Institute in 1903 and 1907-1914, the Hoosier Salon in 1925, and the 1902 Society of Western Artists. His primary dealer was J.W. Young of Chicago. In 1929, John Bundy, who was getting quite frail, moved to Harlingen, Texas with his son but died in a sanatorium in Cincinnati on January 17, 1933.